Rice and beans will forever be my favorite dish to have and maybe that makes me basic, but in this case, I’ll gladly be basic for life! Rice and beans are my ultimate comfort food whether you’re talking about Cuban Black Beans or Dominican Beans. Both pull at heartstrings and satisfy my hunger even when I’m not hungry! In fact, one of the hardest parts about getting in shape is cutting back on rice and beans. Give up bread? Cool. Give up pasta? No problem. Give up rice and beans? Hold on, we have have problem! 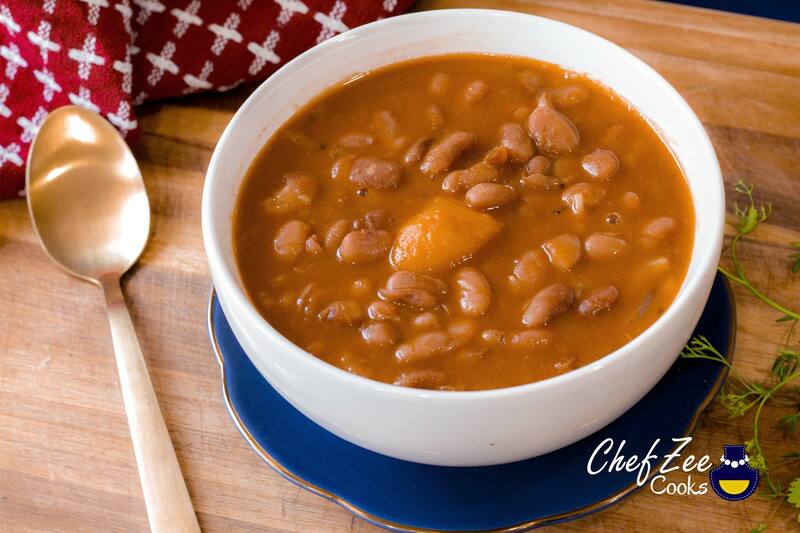 Now I’ve shared a few beans recipes both on my blog and my YouTube Channel: Chef Zee Cooks. They’re all delicious and they each have their very own nuances. There’s a time and place for each of them. Dominican Beans from Scratch are a household staple in any Dominican household. They’re the beans that our grandmothers made and they never cut corner making them! 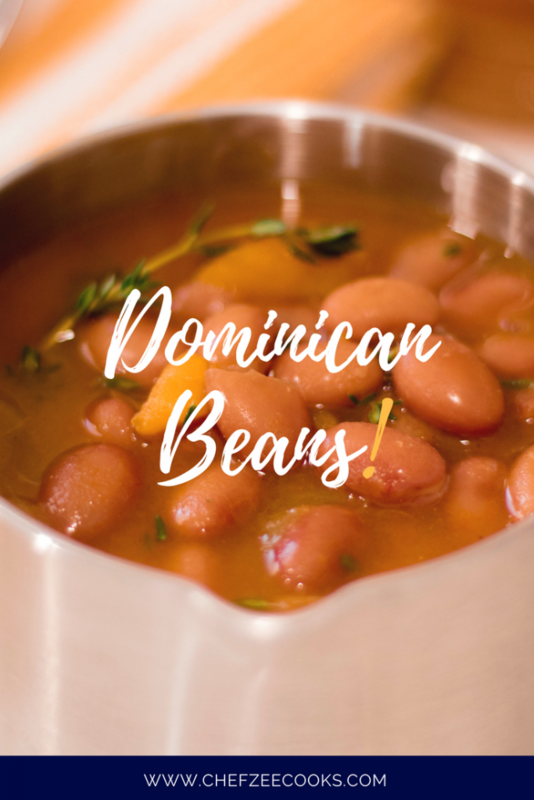 Unlike my Easy Dominican Bean recipe, this recipe shows you how to make Dominican Beans the classic old school way– with a twist! Back in day, Dominicans would harvest red, pink, or pinto beans and boil them for a long time until they got soft. They then seasoned them with traditional spices and some even added sweet root vegetables for a nice depth of flavor. These beans took hours to make and if you were smart, you’d start the night before. Now imagine living in a hot Caribbean country and stewing beans for hours on end with no more than a fan to cool you down? Trust me, I’m sweating alongside with you just thinking about it. Nonetheless, this didn’t stop anyone from making this dish almost everyday! In fact, this is why I love these beans so much. I had them almost every single day while growing up. Growing up, I watched my grandmother make this dish a few different ways. Whenever she was in a rush, she’d use canned beans but this was RARE! And whenever it happened, we had to whisper about because it was a huge secret. La Dona uso habichuela en lata! If I ran and told the neighbors, I’d be sure to get a pela. There was no greater disrespect than to run around telling people that you made canned beans. I never understood it then, and I somewhat get it now, but my grandmother’s canned beans were fire. They were just as delicious as the ones that she’d made from scratch. Time out. Lies. Her Dominican Beans from Scratch were still better than the easy fast version. Regardless of how you make your Dominican Beans, this dish is an absolute treat. You can soften the beans overnight in water, or you can boil them with some oil for about an hour or so until they soften. I personally love using a pressure cooker to soften the beans because it allows me to multitask. It also keeps my 2nd floor apartment rather cool! However you choose to soften your beans, know that there are multiple ways that only vary in time if ever so slightly. You can also choose from a variety of different beans. I personally love using Pinto Beans, but you can also use Roma Beans, Red Beans, Pink Beans and Kidney Beans. There are even some beans that are labeled, “Dominican Beans.” In the end, you want to use a bean that’s reddish or brown in color. Share this yummy recipes to your hungry friends on Pinterest!